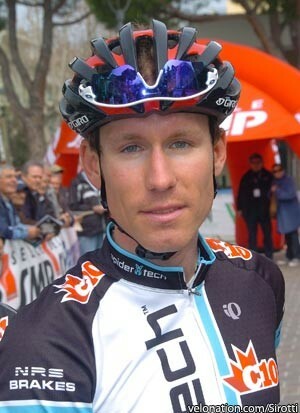 Ryan Roth (Spidertech p/b C10) won the 29th edition of the Tro Bro León, going one better than teammate Will Routley’s second place of 2010, in a solo break at the end of the 206.4km race. The 29-year-old Canadian managed to catch and pass the long break of the day from Eric Berthou (Bretagne-Schuller) and ride on alone to finish 13 seconds clear of Benoît Jarrier (Véranda Rideau-Super U). "I don’t know. I am just surprised!," said Roth after the race. "I can’t believe I caught Berthou from team Bretagne-Schuller. At that point in the race, your brain is barely functioning. But I just remembered in our race meeting, we said this race rewards aggression. With 50km to go, we just kept attacking to make sure we had guys in the front." Guillaume Boivin completed a perfect day for Spidertech p/b C10 by taking the bunch sprint for third, ahead of World under-23 champion Arnaud Démare (FDJ-BigMat). "It would be hard to ask more of the team," said Boivin. "It’s our first win of the season, et we are enjoying it fully. We had been very close to that victory for so long now… it’s great to finally clinch it." The Breton race, which takes place at the very western tip of the Finistère department, to the north of the port city of Brest, takes in 25 sections of rough farm tracks, and is known as l’Enfer du Ouest - or le Petit Paris-Roubaix.